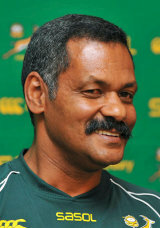 Peter De Villiers made history when he became South Africa's first black coach after being chosen to succeed World Cup winner Jake White in January 2008. Controversy surrounded the appointment as it was admitted by SARU chief Oregan Hoskins that De Villiers' race was a deciding factor in him beating Heyneke Meyer to the post. De Villiers played scrum half for the Griquas and Boland teams during apartheid before beginning his coaching career with amateur club Tygerberg in 1996. His first club appointment was as assistant coach for Western Province in the Currie Cup in 1998, a post he held whilst managing the Under-19s Springboks side. He took the Under-19s to third in the World Championship in 1998. De Villiers coached Currie Cup team Valke during 2002 and 2003, before taking charge of the Springbok Under-21s. He supervised three U-21 World Championships, leading the Boks to third in 2004, first in 2005 and second in 2006. In 2007 De Villiers was handed the coaching role of the Emerging Springboks. He took them to victory in that season's Nations Cup, beating Argentina 'A' 24-10 in the final. By taking the sensible step of maintaining the Rugby World Cup winning squad to the best of his abilities, De Villiers managed to secure a strong base of players to continue the Springboks' recent success. After a mixed season in 2008 which saw the Springboks' first win in New Zealand for 10 years as well as a damaging 19-0 reversal to the same opposition on home soil, De Villiers took charge for the visit of the 2009 British & Irish Lions. His relationship with the media took a battering during the tour as outspoken comments about scrum-half Ricky Januarie and flanker Schalk Burger's ban for gouging drew censure from SARU and fierce criticism from the Lions. Centre Brian O'Driscoll labelled De Villiers 'a disgrace' following the incident, but the coach had the best of the on-field confrontations as his side pulled through 2-1 in the Test series. Later the same year, De Villiers went on to steer the Springboks to only their third Tri-Nations title and first since 2004. Three victories over the All Blacks and two more against the Wallabies propelled them to the southern hemisphere crown with their only reverse coming at the hands of Australia in Brisbane. During their tour of the northern hemisphere towards the end of 2009, the Springboks suffered defeats to Ireland and France. They gained their revenge over France, though, when the Six Nations Champions toured South Africa in June. There were also wins over Wales and two against Italy. But controversy continued to stalk De Villiers in 2010. After opeing their 2010 Tri-Nations campaign with successive defeats to New Zealand, the South Africa coach claimed that his side were the victims of a refereeing conspiracy. New Zealand coach Graham Henry shrugged of the claims by saying, ''I can't really take anything he (De Villiers) says seriously". Matters continued to deteriorate for South Africa with defeat to Australia in Brisbane - the third defeat in their opening three fixtures for the World Champions. De Villiers was given a vote of confidence by his employers at the South African Rugby Union (SARU) and assured that his job was safe before he was issued with a notice of alleged misconduct by the IRB for his conspiracy theory claims. De Villiers departed his role following South Africa's quarter-final exit at the Rugby World Cup in 2011 and, following a whirlwind promotional tour for his autobiography Politically Incorrect, he re-emerged as director of rugby at the University of the Western Cape.